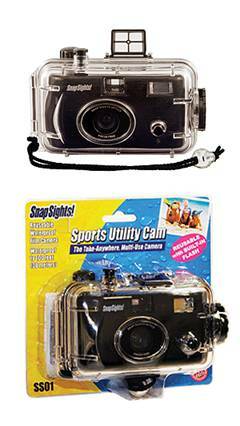 SS01 Sports Utility Camera with Flash:This tough and durable film camera allows price points comparable to disposable camera models. The camera is preloaded with film, ready to use and can be reloaded easily with standard 35mm film. SS01 can be used above/below water, indoors/outdoors, night or day. Its unique features make it a perfect camera for a wide range of sports activities including: Diving, camping, kayaking, fishing, hiking and more! Each camera is individually pressure tested at the factory to 100 feet Other tests include flash and winding operation. Rigorous quality control is one reason why we are industry leaders in low return rates and customer satisfaction. d) Camlock clasp with hinged back.